Is the Rev. 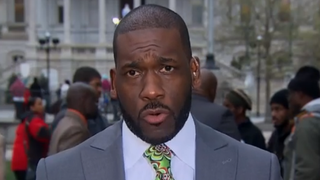 Jamal Bryant the Man to Save Baltimore? The Rev. Jamal Harrison Bryant is emotionally spent. The past 11 days had taken their toll when The Root spoke with Bryant, 43, over the phone Wednesday. We asked him how he was handling these “hectic” days—his home city of Baltimore mired in charges of police brutality, the suspicious death of Freddie Gray while in police custody, the subsequent peaceful protests and shocking violence leading to the National Guard’s patrolling of another American city. Bryant, who delivered the eulogy at Gray’s funeral Monday, knows that it’s been chaos, but the words to truly describe it have failed him. “Hectic” will suffice, among a few other words. Bryant’s search for the right words—whether in describing his experiences or during his talks with the press—is one he takes seriously, one he is careful with, considering his history. The charismatic, hip-hop-style preacher is a rising star both in the black Christian community and as an activist, traveling to Ferguson, Mo., and Staten Island, N.Y., during the Michael Brown and Eric Garner deaths at the hands of police. But his mouth—the same one that gives fiery speeches and motivates the masses—also gets him in trouble. Most notably when he quoted Chris Brown in a sermon that went viral last summer. In a sermon he gave on black men working to find “a black woman of substance,” he referenced Brown’s hit “Loyal,” which features the chorus, “These hoes ain’t loyal,” which Bryant quoted. A lot of women were not amused. Brown, known as much for his violent antics as for his former teen-heartthrob status, is still a sore subject for many. A pastor seemingly endorsing misogyny was problematic, especially when nearly 60 percent of the pews in black churches are filled with black women. Still, Bryant bristles at those who have labeled him a woman-hater and maintains that his intent was in the right place. “Listen to the whole sermon and not listen to a sound bite. Anything in a sound bite can be taken out of context,” he said, adding that people often quote other parts of the viral “Loyal” sermon—namely the “Little girls with dreams become black women with vision” quote—but won’t attribute them to him because he’s been labeled a sexist. Still, he regrets the wording. “It was regrettable, and I’m more mindful and conscious of what I speak now,” Bryant said. Bryant believes that it’s more important to focus on our commonalities than on the one thing we may disagree on—whether that means putting aside gay marriage, getting street gangs to sign a peace treaty in the wake of Freddie Gray’s death or marching alongside Nation of Islam members to protect citizens. One thing that he’s found he can get people to agree with him on is the need for change in Baltimore. Change from police brutality and no accountability. With Gray’s death, Bryant said, the “Pandora’s box” was opened, and although several investigations have been opened into the 25-year-old’s death, there are still no answers as to what happened to Gray while he was in police custody, sustaining injuries that would eventually kill him. This lack of justice is what Bryant believes set off youths in Baltimore and sent them out into the streets. Bryant, who had harsh words for President Barack Obama (“Black America has given Obama a pass. Can you imagine if Bush called these black children thugs? We’d be matching down Pennsylvania Avenue now. It’s hard to protest Pharaoh when you think he’s Moses”), was a bit easier on Baltimore’s mayor, Stephanie Rawlings-Blake. Rawlings-Blake has been under fire for her handling of the riots that eclipsed the protests of Gray’s death, with many blaming her initially lax approach for allowing parts of Baltimore to burn. “Her greatest failure is not in policy but in P.R. She has not effectively or efficiently communicated what has taken place,” Bryant said. As an example, Bryant pointed out that Rawlings-Blake announced that the officers involved in Gray’s arrest were put on paid administrative leave, but she didn’t explain that her hands were tied and Maryland statute states that an officer cannot be fired unless he or she is charged with a felony. Because of his dedication to the church (“I’m one of the few people in the world that I’m actually glad to be a pastor. I don’t want to be bishop overseer. I don’t need a robe”) and his vision for Baltimore, Bryant has decided to keep his focus on the grass roots. While he doesn’t know where the next five to 10 years will take him, he is rooted in the belief that he must dedicate himself to changing Baltimore.